After a grueling month-long slog across 700 miles of ice sheet, the GrIT team pulled in to Summit Station on Friday, May 9, writes GrIT manager Geoff Phillips in his latest update, excerpted below. They pulled into station at about noon on Friday and spent the afternoon retrieving another sled they had dropped about 10 miles from camp. The guys were excited to take showers and clean some clothes before settling into an amazing dinner prepared by Summit staff. 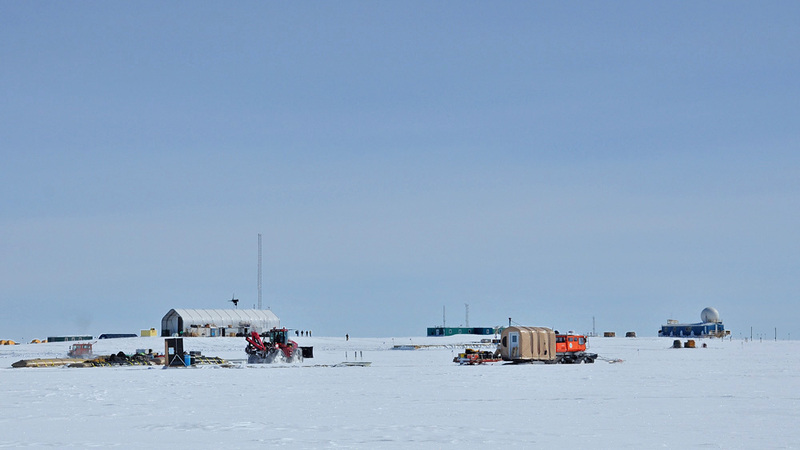 Saturday the team started unpacking the Durabase cargo sled at Summit and delivered the drilling fluid and casings to the field camp a few miles away [where a team is testing a new intermediate depth drill for use in Antarctica beginning in 2014]. While retrieving Nanoq, the tractor with serious engine and transmission problems, they did a couple of different tests to see how it would tow with and without a sled under it. Without a sled the results were pretty dismal: they were only able to get into 3rd gear, much too slow to tow back to Thule. The second test was conducted with the tractor on a sled and that went much smoother, although more testing is required to find out if one tractor or two will be required to tow the sled and tractor back to Thule. The GrIT team is taking a well deserved day off today and will resume offloading cargo on Monday.